Currently in London there are two audio exhibits – of sorts – taking place in London. And they’re only about a five minute walk apart. At the Wellcome Collection on the Euston Road, passers-by are currently being exposed to White Sounds: An urban seascape. 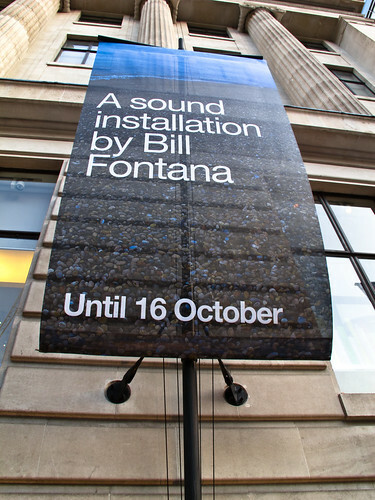 Bill Fontana is bringing the sounds of Chesil Beach in Dorset to the Euston Road. Essentially a live audio feed from the beach is being fed to a series of massive speakers installed outside the front of the Wellcome Collection building. I’ve passed by it a couple of times now, and while it’s almost certainly inaudible to anyone driving by, pedestrians walking by are regularly stopping to listen. Different speakers seem to be broadcasting different audio elements from the beach. Obviously you’re listening to this against the backdrop of heavy traffic on the Euston Road, but that’s the point of it. There’s also film footage (recorded) available to view inside the building. I’d suggest it’s worth a detour to experience. It’s on until 16 October. And it’s worth noting that the café inside the Wellcome Collection is a lovely tranquil place away from the noise of Euston. It even has free WiFi. A little further down the Euston Road is St Pancras Station – gateway to Paris, Brussels, and St Albans. It’s currently home to a piece called Audio Obscura by Lavinia Greenlaw. This piece, which has already appeared at Manchester Piccadilly Station as part of the Manchester International Festival, is a 30 minute long audio soundscape/drama. You collect a small mp3 player attached to a pair of noise cancelling headphones, and you’re left to wander the majesty of St Pancras while listening to fragments of conversations which could be coming from people as they pass by. 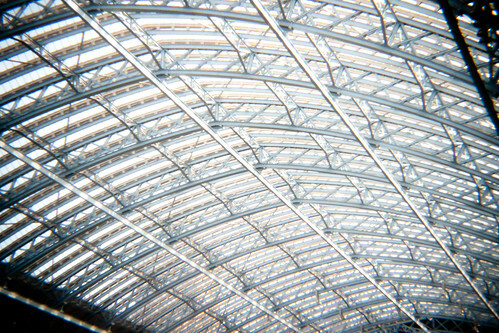 The effect works incredibly well in a busy station like St Pancras. I found myself standing in an unused part of the station, staring at passers by imagining that they might be saying the words I was hearing. Again it’s well worth catching before it finishes on the 23 October.